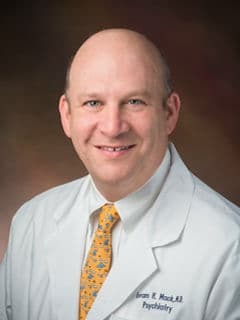 Avram H. Mack, MD, is an attending physician, co-medical director of the Behavioral Health Integrated Program, and associate chair for Quality and Patient Safety in the Department of Child and Adolescent Psychiatry and Behavioral Sciences at Children’s Hospital of Philadelphia. Dr. Mack is a psychiatrist who specializes in child and adolescent psychiatry, addictions, forensic psychiatry, medical education and institutional high-reliability/safety acculturation. He came to Children’s Hospital of Philadelphia after serving as an attending psychiatrist and faculty member (professor) at the Medical University of South Carolina and then at Georgetown University. Dr. Mack’s clinical practice has included work in residential, inpatient, outpatient, partial, consultation and emergency settings for patients of all age groups. Currently, Dr. Mack serves as a clinician and co-director of the Behavioral Health Integrated Program in the Department of Child and Adolescent Psychiatry and Behavioral Science at CHOP. He and colleagues provide daily integrated or consultative service to the pediatric units and the emergency department at the Hospital and teach Hospital trainees on pediatric psychosomatic medicine. Dr. Mack’s many roles as a leader and administrator led him to take part in many improvement projects at Children’s Hospital, particularly regarding patient safety and high reliability. Dr. Mack is a leader in psychiatry. His work has been recognized by organizations including the American College of Psychiatrists and the Washington Psychiatric Society. He received the Association for Academic Psychiatry’s Education Award for his work in fostering the patient safety culture in psychiatry and general medical education, an interest which extends to when he was a trainee at Harvard and Columbia and a trustee of the American Psychiatric Association. Dr. Mack’s research has appeared in publications such as Psychosomatics and FOCUS. He has also edited books on addiction and substance use and held leadership positions in several professional organizations, even leading the history of psychiatry section of the American Psychiatric Association. Drawing on his large national experience providing court testimony, Dr. Mack also teaches CHOP’s child and adolescent psychiatry fellows about forensic psychiatry. Dr. Mack has provided evidence pertaining to psychiatry and substance use in various settings, including federal and state trial courts, federal and state administrative bodies and others. Having served as the senior medical advisor for the State of Maryland’s Office of Forensic Services, he also has experience in the administration of agency-based forensic evaluation systems for adult and juvenile proceedings. Brooks, E., Sharp, A., Mack, A.: Psychiatric conditions among patients with CLABSIs: Indications of opportunities for the reduction of adverse outcomes. (Poster presented at American Association of Medical Colleges, Integrating Quality Meeting, Rosemont, IL, June 12, 2015). Mack, A.H., Brady, K., Frances, R.J. (Eds. ): Clinical Textbook of Addictive Disorders, 4th Edition, Guilford Press, New York (in press for 2015 publication). Mack, A.H., Harrington, A.L., Frances, R.J. (Eds. ): Clinical Manual on the Treatment of Alcohol and Addictions, American Psychiatric Press, Washington, DC, 2010. Frances, R., Miller, S.I., Mack, A.H. (Eds. ): Clinical Textbook of Addictive Disorders, 3rd Edition, Guilford Press, New York, 2005. Mack, A.H., Franklin, J., Frances, R.J. (Eds. ): Concise Guide to the Treatment of Alcohol and Addictions, 2nd Edition, American Psychiatric Press, Washington, DC, 2001 and Spanish Translation, Masson, 2003. Frances, R.J., Mack A.H., Lightdale, H.A. : Psychodynamics (Chapter 25) in: Galanter M., Kleber H. (Eds.) American Psychiatric Press Textbook of Substance Abuse Treatment, 5th Edition, American Psychiatric Press, Inc., Washington, DC, 2015, pp. 365-384. Mack, A.H.: Forensic Addiction Psychiatry (Chapter 52) in Galanter M., Kleber H. (Eds.) American Psychiatric Press Textbook of Substance Abuse Treatment, 5th Edition, American Psychiatric Press, Inc., Washington, DC, 2015, pp. 783-804. McGee, M., Mack, A.H.: Prevention of Adolescent Psychoactive Substance Use (Chapter 11) in Rosner R. (Ed.) Clinical Handbook of Adolescent Addiction, Wiley-Blackwell, Oxford (UK), 2013, pp. 125-131. Mack, A.H.: Child and Adolescent Psychiatry (Chapter 1) in Talbott J. (Ed.) Yearbook of Psychiatry and Applied Mental Health, Elsevier, Philadelphia, 2013, pp. 1-72. Mack, A.H.: Child and Adolescent Psychiatry (Chapter 1) in Talbott J. (Ed.) Yearbook of Psychiatry and Applied Mental Health, Elsevier, Philadelphia, 2012, pp. 1-74. Mack, A.H.: Substance-Related Disorders (Chapter 6) in Rothschild A. (Ed.) Evidence-Based Guide to Antidepressant Medications, American Psychiatric Press, Inc., Washington, 2012, pp. 171-188. Mack, A.H.: Child and Adolescent Psychiatry (Chapter 1) in Talbott J. (Ed.) Yearbook of Psychiatry and Applied Mental Health, Elsevier, Philadelphia, 2011, pp. 1-62. Mack, A.H.: Child and Adolescent Psychiatry (Chapter 1) in Talbott J. (Ed.) Yearbook of Psychiatry and Applied Mental Health, Elsevier, Philadelphia, 2010, pp. 1-74. Lightdale, H.A., Mack, A.H., Frances, R.J.: Psychodynamic Psychotherapy (Chapter 9) in Galanter M., Kleber H. (Eds.) Psychotherapy for the Treatment of Substance Abuse, American Psychiatric Press, Inc., Washington, DC, 2010, pp. 219-248. Mack, A.H.: Child and Adolescent Psychiatry (Chapter 1) in Talbott J. (Ed.) Yearbook of Psychiatry and Applied Mental Health, Elsevier, Philadelphia, 2009, pp. 1-66. Mack, A.H.: Conduct Disorder in Shweder R. (Ed.) The Child: An Encyclopedic Companion, University of Chicago Press, Chicago, 2009, pp. 203-205. Frances, R.J., Mack A.H., Lightdale, H.A. : Psychodynamics (Chapter 23) in Galanter M., Kleber H. (Eds.) American Psychiatric Press Textbook of Substance Abuse Treatment, 4th Edition, American Psychiatric Press, Inc., Washington, DC, 2008, pp. 333-349. Mack, A.H., Barros, M.: Forensic Psychiatry (Chapter 48) in Galanter M., Kleber H. (Eds.) American Psychiatric Press Textbook of Substance Abuse Treatment, 4th Edition, American Psychiatric Press, Inc., Washington, DC, 2008, pp. 689-702. Mack, A.H., Lightdale, H.A. : Substance-Related Disorders and Suicide (Chapter 17) in Simon R.I., Hales R.E. (Eds.) Textbook of Suicide Assessment and Management, American Psychiatric Press, Inc., Washington, DC, 2006, pp. 347-366. Weinstein, H., Kim, D., Mack, A., Malavade, K., Saraiya, A.: Prevalence and Assessment of Mental Disorders in Correctional Settings (Chapter 3) in Scott C. (Ed.) Handbook of Correctional Mental Health, American Psychiatric Press, Inc., Washington, DC, 2005, pp. 45-68. Mack, A., Kahn, J., Frances, R.: Addictions in the Workplace (Chapter 15) in Frances R., Miller S.I., Mack A. (Eds.) Clinical Textbook of Addictive Disorders, 3rd Edition, Guilford Press, New York, 2005, pp. 340-353. Mack, A.H., Frances, R.J., Miller, S.I. : Forensic Issues (Chapter 16) in Frances R., Miller S.I., Mack A. (Eds.) Clinical Textbook of Addictive Disorders, 3rd Edition, Guilford Press, New York, 2005, pp. 354-366. Mack, A.H., Franklin, J., Frances, R.: Substance Use Disorders (Chapter 4) in Hales R.E., Yudofsky S.C. (Eds.) Essentials of Clinical Psychiatry, 2nd Edition, American Psychiatric Publishing, Arlington, 2004, pp. 115-187. Frances, R.J., Mack, A.H., Borg, L., Franklin, J.: Psychodynamics (Chapter 27) in Galanter M., Kleber H. (Eds.) American Psychiatric Press Textbook of Substance Abuse Treatment, 3rd Edition, American Psychiatric Press, Washington, 2004, pp. 327-353. Billick, S.B., Mack, A.H.: The Utility of Residential Treatment Programs in the Prevention and Management of Juvenile Delinquency (Chapter 7) in Flaherty L. (Ed.) Adolescent Psychiatry, Volume 28, The Analytic Press, Mahwah, 2004, pp. 95-115. Mack, A.H., Franklin, J., Frances, R.: Substance Use Disorders (Chapter 8) in Hales R.E., Yudofsky S.C. (Eds.) The American Psychiatric Publishing Textbook of Clinical Psychiatry, 4th Edition, American Psychiatric Publishing, Washington, DC, 2003, pp 309-377. Mack, A.H., Rosecan, J., Frances, R.J.: Drugs: Abuse and Dependence (Chapter 24) in Kahn J.P., Langlieb A. (Eds.) Mental Health and Productivity in the Workplace: A Handbook for Organizations and Clinicians, Jossey-Bass, Baltimore, 2002, pp. 481-502. Frances, R., Mack, A.H., Borg, L., Franklin, J.: Psychodynamics and the Treatment of Substance-Related Disorders (Chapter 30) in Gabbard G. (Ed.) Treatments of Psychiatric Disorders, 3rd Edition (Volume 1), American Psychiatric Publishing, Washington, DC, 2001, pp. 829-837. Frances, A., Jones, C., Mack, A.H., Brown, R.: DSM-IV in Wolman B. (Ed.) The International Encyclopedia of Psychiatry, Psychology, and Psychoanalysis, Henry Holt, New York, 1996, pp. 170-171. Frances, A., Mack, A.H., Ross, R., First, M.B. : The DSM-IV Classification and Psychopharmacology (Chapter 71) in Bloom F., Kupfer D. (Eds.) Psychopharmacology: The Fourth Generation of Progress: An Official Publication of the American College of Neuropsychology, Raven, New York, 1995, pp. 823-828. Frances, A., Mack, A.H., First, M.B. : DSM-IV and Psychiatric Epidemiology (Chapter 13) in Tsuang M., Tohen M., Zahner G. (Eds.) Textbook of Psychiatric Epidemiology, Wiley-Liss, New York, 1995, pp. 273-279. Frances, R., Mack, A.H., Frosch, W.: Substance-Related Disorders (Chapter 24) in Sacks M., Sledge W., Warren, C. (Eds.) Core Readings in Psychiatry: An Annotated Guide to the Literature, 2nd Edition, American Psychiatric Press, Washington, 1995, pp. 301-313.